The Strictly Sail Pacific boatshow will be happening in Jack London Square in Oakland on April 15-18. This is a must-do for die-hard enthusiasts, and for anyone interested in getting involved in sailing. J/World will be out on the docks again this year, and we’ll have our BoatShare J/105 on display. 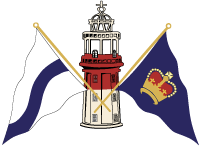 If you have ever been interested in fractional sailing, swing by and take a look…. and of course we’ll have info on all our classes and programs as well. Our annual Spring J/105 Racing Clinic will be held on May 22-23 out of our Jack London Square facility. This event is open to both individuals and full teams. Sail trim, sail handling, boat handling, tuning and so on are all topics of discussion. Everyone gets to rotate thru all the jobs aboard, and will come out of the session able to tackle any job aboard the boat. This is a fantastic way for crews to get up to speed for the coming season, for skippers to chip the rust off, and for sailors of all types to broaden their overall skills. So whether you are into racing or cruising, our annual trip to Hawaii has something for you. In early July, the J/World team takes off on the 2010 Pacific Cup, racing our turboed Santa Cruz 50 with six sailors plus three coaches from San Francisco to Kaneohe Bay. The Pac Cup is a fantastic event, and the crossing to Hawaii is a truly memorable passage. We have only two berths available, so go here for more info. And so if the racing trip isn’t your cup of tea, maybe you’d like to join our annual offshore cruise from Hawaii back to California. This is a perfect way to click off some offshore miles and build your experience under the watchful instruction of our offshore coaches. We’ll cover everything, and you’ll do everything: standing watches, navigating, helming, weather routing, radio communications, and so on… everyone is an active and equal member of the team. Learn more here. Also, tons of Learn to Sail courses happening on San Francisco Bay this Spring! What are you waiting for?? MEXORC is six days of buoy and short distance racing in Banderas Bay. The event includes most of the boats that raced into town from California, some local teams, and a number of boats who come up from Acapulco. Run every two years, this event is always a huge production, and this year was no exception! The wave rolled through Banderas Bay on our practice day kicking up some pretty wild currents. There was a river running across the harbor doing an easy three knots which had the docks throwing up bow-waves! Then the water went up, then back down, a swing of about three feet in a 15 minute window… strange things ’round here. They really pull out all the stops for this event, and this year they have outdone themselves: the regatta was kicked off by the President of Mexico! 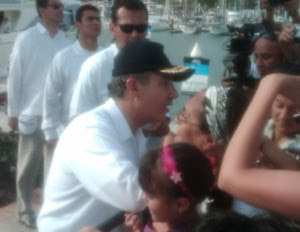 But not only was President Calderon present for the first day of racing, but on the final day he was watching racing from the committee boat, running down a long line of sailors and locals along the embarcadero shaking hands, and (of course) politicking away with speeches. And Then They Were Off…. Regata Copa México [MEXORC] opened on Sunday out of La Cruz de Huanacaxtle, on Bahia de Banderas, which I will say for the umpteenth time is one of the best places in the world to sail. Got that right. And this year was no exception. The first part of the week was classic MEXORC racing: clear skies, and hearty afternoon thermals stepping up every afternoon. Midweek the weather pattern shifted and we had some slightly more, shall we say ‘variable’ winds (ok, there might have been some more choice words uttered by some tacticians when the 80+ degree shifts rolled thru the course!). But overall, it was outstanding. Josh and Eugenie were the coaches aboard Bob Musor’s J/130 Sceptre. We also had four students aboard. Everyone on the team did a great job and are to be commended for tacking such a challenging event! People swapped positions and worked on whatever skills they were interested in polishing for their local racing. 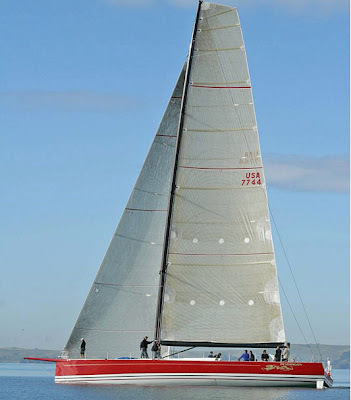 Barry was racing onboard the brand-spanking-new 70 foot Pendragon VI (above). Competing in her very first regatta provided a bit of a shakedown-under-fire, but she showed some bursts of speed as they wound her up towards the end of the week. 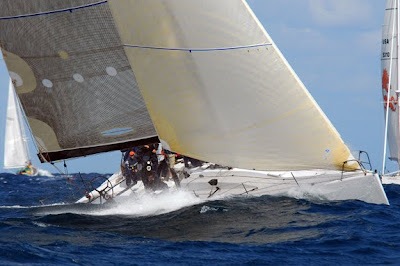 I was the navigator aboard the Transpac 52 Flash (above), with Quantum’s Jeff Thorpe calling shots and my good friend (and USCG insider) Kevin Sullivan on the pointy end). The crew were mostly San Franciscans, but many aboard hadn’t sailed on that boat together before, but we still rallied to the cause. All things considered, the third place overall that we ended up with wasn’t too bad. So that’s the MEXORC report. There’s more on Kimball’s blog. We’ll do it again in two years. The BANDERAS BAY CLINIC and REGATTA is our most popular event this time of year. Come join us for an three day clinic/workshop aboard our J/80s, then race in the Banderas Bay Regatta! This is a great way to sharpen your skills and have a really fun time doing it. Come as an individual or a group. Kimball Livingston of Sail Magazine says of Banderas Bay: “I will say for the umpteenth time [it] is one of the best places in the world to sail.” Come check it out for yourself. Our annual Spring J/105 Racing Clinic will be held on May 22-23 out of our Jack London Square facility. This event is open to both individuals and full teams. Boat owners who wish to attend with their own boats can do so for free! For full information, please contact us or click here. We are offering one of our combo course comprised of out Performance Cruising class coupled with a Three Day Liveaboard Cruising course in San Francisco on April 5-11. This is a tremendous value and a great way to take your skills to a whole new level. You will sail on boats from 26 to 40 feet, and cover everything from advanced sail trim to diesel engines… Contact us for more info.